Fifa chief Sepp Blatter says he is not being investigated by United States authorities - but admitted former colleagues are. But the 79-year-old Swiss said: "I know that in the US there is an investigation against former people who have been in my government. "There is nothing against me." The investigation into alleged football corruption reportedly involves ex-Fifa executive committee members, American Chuck Blazer and Trinidadian Jack Warner. 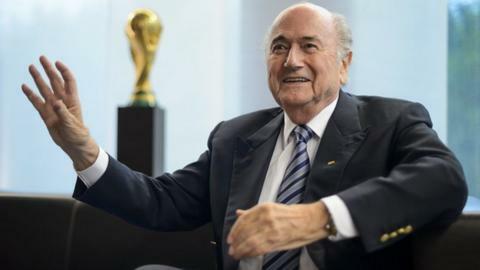 Blatter added he plans to visit the US in June 2016, to coincide with next year's Copa America tournament. He last visited the US in May 2011 for a meeting of North American confederation Concacaf, and it had been suggested - including in an ESPN documentary this week - that he had deliberately stayed away since then due to the probe. However, Blatter, who is currently running for a fifth term as president of football's world governing body, said: "I will be there if elected. Even if not elected, they will invite me I am sure." Earlier on Friday, Blatter sent a letter to all 209 Fifa member associations identifying several areas where "there is still work to be done", including promoting women's football, combating discrimination and racism, and cracking down on match fixing. A Fifa spokesman said it was unconnected to Blatter's bid for re-election. Election rules state that candidates must not mix campaign activities with duties connected to their official positions. Fifa's member associations will appoint their next president when they meet in Zurich on 29 May.